Last week was a fairly busy one for economic data with 30 releases scattered throughout the week. The majority of the reports were either weaker than expected, or in the case of indicators with no estimates, showed a decline versus their last print. There were no indicators on Monday, so the release of January Small Business Optimism from the NFIB kicked off economic data on Tuesday with a greater than expected decline. 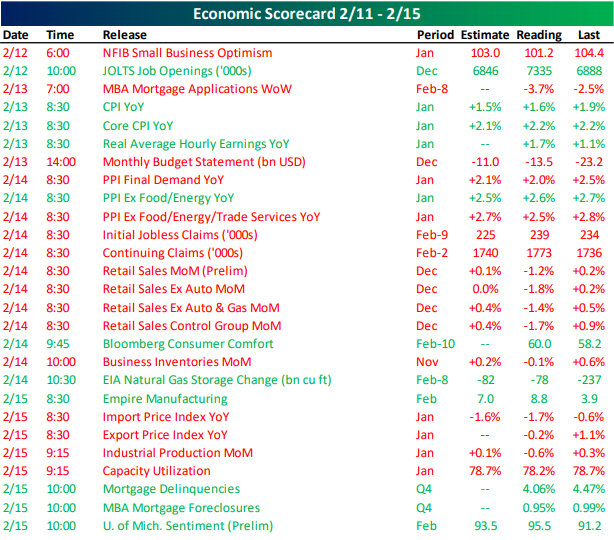 The most negative aspect of the data last week, though, was Thursday’s Retail Sales report for December, but as we mentioned last week, there are numerous reasons to be skeptical of the data. CPI came out on Wednesday and was slightly stronger on a y/y basis. PPI on Thursday missed estimates, though, and Import and Export Prices were both weaker than expected on Friday, posting y/y declines. Turning to this week, with the holiday yesterday, the economic calendar takes a bit of a breather. At 10:00 AM today we will get February data on homebuilder sentiment, followed by Mortgage Applications tomorrow. 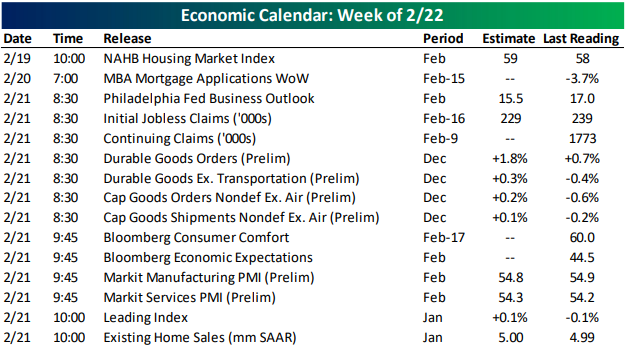 Thursday we will get a flood of data including the Philly Fed, Jobless Claims, Durable Goods, preliminary Markit Manufacturing and Services, Leading Indicators, and Existing Home Sales. There are no scheduled releases for Friday.